We are frequently asked to make recommendations on center lift pontoon trailers. Our standard response is that for most applications we recommend the wide axle stance of our bunk style trailer. However, there are applications for the center lift style trailers. Neighbors sometimes want center lift pontoon trailers so that the trailer can be used on more than one pontoon boat. There are some lakes with very poor-shallow ramps where it’s almost impossible to launch from an ordinary trailer. There are storage concerns where individuals want to fit their pontoon boat in a garage or building with a low overhead door, etc. These are all valid reasons for considering a center lift pontoon trailer. 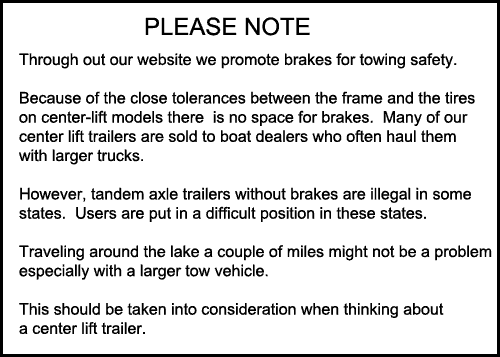 However these considerations must be weighed against the potential danger of the center lift pontoon trailer. Center lift trailers can be very tippy. That means that if you clip a curb with a tire or a sudden gust of wind hits the boat and trailer, the whole load can tip over. Thousands of pontoon boats have gone down the road safely on center lift trailers, but the potential for danger is always present. The modern pontoon boat with extensive furniture layouts, 30+ gallon gas tanks and heavier engines increases the potential for weight distribution problems on a center lift narrow axle wheel base pontoon trailer. 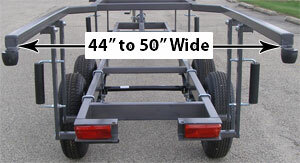 The width of center lift pontoon trailers varies from about 44” to 50”. With a center lift pontoon trailer you need to know the dimension between the pontoon tubes. Pontoon boat manufacturers fit their pontoons in various ways, from the outside edge of the deck (96” or 102”) to a few inches inside the deck. Typically a 8’ wide pontoon boat (96”) with 23” diameter pontoons will have a 50” opening. If the tubes are positioned an inch or two inside from the deck, this dimension is smaller. To prevent gouging the pontoon tube, the trailer should be at least 2” narrower on each side than the opening between the pontoon tubes. There is a another fit problem that is usually associated with new pontoon boats. Some pontoon boats (Bennington) have extra long motor mounts (transoms) that can be up to 70” long. 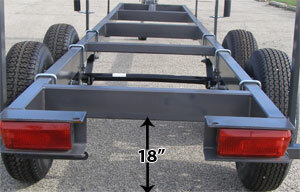 Some brands of center lift pontoon trailers “throats” (in the stern) can be as short as 40”. You will not be able to fit a 70” transom on a center lift trailer with a 40” opening. It’s important to know the width dimension and depth of the throat of a center lift pontoon trailer before you buy. Standing in the middle of the trailer, grab the top rail, bend your knees and see if you can lift the trailer wheels off the ground. The higher you can lift the trailer off the ground, the easier that trailer will tip. but the center of gravity is 33” off the ground. barely lift it off the ground. The lower the center of gravity, the more stable the center lift pontoon trailer will be. Box frame pontoon trailers that transfer the weight of the pontoon boat to a lower frame are more stable than pipe frame pontoon trailers. 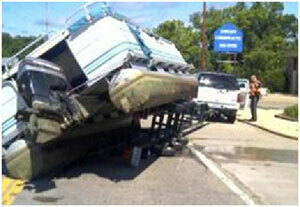 Some brands of pipe frame pontoon trailers have the center of gravity 3’ off the ground, and are very tippy. 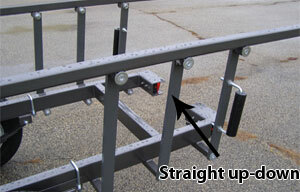 On box frame trailers, look for transfer arms to be straight up and down when the frame is in the up position. These arms transfer the weight of the pontoon boat from the top frame to the bottom. Arms that are not straight up and down when the trailer is in the up position will not transfer the weight properly to the lower frame. The more weight transferred to the lower frame, the less tippy the boat and trailer will be. 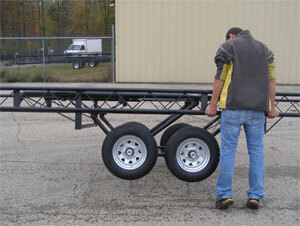 Some center lift pontoon trailers have arms that are at a 30 degree angle. In our opinion, this is a design defect. With the lifting arms at an angle, not only to they not transfer the weight properly, they place unnecessary stress on the cable and winch when in the up position.